A simple, selective and sensitive method for the determination of carboxylic acids has been developed. A mixture of formic, acetic, propionic, valeric, isovaleric, isobutyric, and isocaproic acids has been separated on a polymethacrylate-based weak acidic cation-exchange resin (TSK gel OA pak-A) based on an ion-exclusion chromatographic mechanism with detection using UV-photodiode array, conductivity and atmospheric pressure chemical ionization mass spectrometry (APCI-MS). 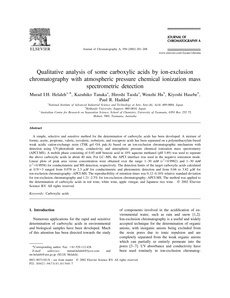 A mobile phase consisting of 0.85 mM benzoic acid in 10% aqueous methanol (pH 3.89) was used to separate the above carboxylic acids in about 40 min. For LC-MS, the APCI interface was used in the negative ionization mode. Linear plots of peak area versus concentration were obtained over the range 1-30 mM (r2=0.9982) and 1-30 mM (r2=0.9958) for conductimetric and MS detection, respectively. The detection limits of the target carboxylic acids calculated at S/N=3 ranged from 0.078 to 2.3 muM for conductimetric and photometric detection and from 0.66 to 3.82 muM for ion-exclusion chromatography-APCI-MS. The reproducibility of retention times was 0.12-0.16% relative standard deviation for ion-exclusion chromatography and 1.21-2.5% for ion-exclusion chromatography-APCI-MS. The method was applied to the determination of carboxylic acids in red wine, white wine, apple vinegar, and Japanese rice wine.